You choose which kind of greens you like in your pie (spinach, leek, green onions (the fresh green onion), endive, chicory, amaranth leaves aka vlita in greek) it must be approximately 1 kilo. *tip: you must really wash them well before you cut them. The size of the pan and the quantity of the greens depends on how thick or thin you like to make it. Now the fun part! Put your hands in and start stirring!! You will notice that, while you stir the ingredients, the greens are slightly shrinking. It is because of the salt and you will see that the stuffing that seemed too much, now seems just enough. At this point you check if it is salty enough for you. We recommend less salt because feta cheese is salty enough. 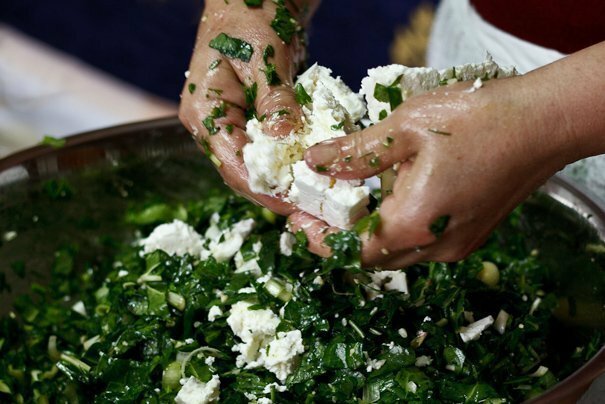 Now put the feta cheese in by breaking it with your hands and be careful when stirring it, you don’t want it to get into smithereens! Make sure you kind of seperate in half the stuffing and start by placing evenly one part of the mix in the pan with the fyllo you opened. You tuck inside the first two sheets and place two more sheets on top to seal it! in a preheated oven and place it in the middle oven rack. It is the happy place where air is circulating, the heat sources are evenly distributed, and tops and bottoms aren’t in danger of burning or browning too quickly. It should look like this when you take it out! pick a flat pan same size to the pan you used and turn the pie upside down. Then slide it upside down to the pan you used to bake it! It is easier to cut and if by any chance the pie is not well baked at the bottom you can bake it again!